Seven states reduced or altered their promises of fixed COLAs that ranged from 2.5-3.5 percent annually, regardless of actual inflation: Colorado, Illinois, Minnesota, Montana, New Mexico, Ohio, and South Dakota. Florida eliminated its fixed COLA, but the law tentatively reinstates it in 2016, if the funds are available. Three states have ended their COLAs – New Jersey, Rhode Island, and Oklahoma – with little likelihood in the near-term they’ll be restored. Six states with COLAs linked to the Consumer Price Index reduced or altered them: Connecticut, Maine, Maryland, Oregon, Washington, and Wyoming. COLA provisions insulate older people who’ve left the labor force from the vagaries of inflation. But in most of the affected states, employees have another hedge against inflation, because they also participate in the Social Security system, which has an annual COLA adjustment. Employees are not covered by Social Security in four of the states: Colorado, Illinois, Maine and Ohio. As far as I know, Massachusetts belongs in that group, too. What no one wants to talk about is how pensions got in this mess. It is a combination of retroactive pension increases put through to benefit Generation Greed, and taxpayer underfunding to benefit other members of Generation Greed. The division of guilt between the (ex) public employees and the unions, and advocates of lower taxes, varies from place to place. What is disturbing is that in the very places where the unions are most guilty, existing and retired employees are sacrificing nothing, and the burden is being shifted to everyone else including new hires. As in New York City. They are additional retroactive pension increases being voted on the state legislature as we speak. Given that these pensions were the most generous to begin with, this is an injustice. And in the very places where past taxpayers are the most guilty public employees, including existing public employees and retirees, are being hit the hardest. Not only having retroactive pension increases taken back, but also at risk of losing the benefits they were promised when hired, which is wage theft. And yet all sides agree “let’s not talk about the past.” Because it is either older and retired employees and older and moved away taxpayers who are guilty. And future and younger workers, taxpayers and public service recipients who are being screwed. In decades past, state and local government workers were correct to have felt their pensions were more secure than the vanishing pension coverage in the private sector. At the time, there was a significant disparity between the incomes of government workers and their private sector counterparts. So, a more robust pension calculation was reasonable. However, in recent years attempts have been made to narrow that income disparity – but, without at the same time modifying (i.e., reducing) the formula for the government sector pension calculation. As a result, with the increase in government wages connected to a still very lucrative pension calculation, projections clearly indicate that the combination of the two going forward is not something that the taxpayer can afford (nor should be forced) to pay. These COLA adjustments should continue to occur. In every situation, these pension “promises for government workers” should be as they are for private sector workers – that is, dependent upon market conditions. @ Brian: I thought the private sector respected the law of contracts, that a deal is a deal. Not true for government workers in your view? Folks who upheld their part of the bargain, and now see it being welched on by over-stuffed politicians like Christie? I feel you are speaking purely out of envy, not fairness. As a trustee for a single employer plan situated in the state of Michigan, where the state constitution contains provisions that say an accrued financial pension benefit is a contractual obligation that shall not be diminished or impaired, I witnessed the Plan Sponsor reduce a COLA benefit, retroactively. This, despite the COLA benefit having been paid for with principal and interest derived from 5-6% of the employees gross wages, which had been contributed to the Plan’s irrevocable trust for a period of 20 years (payroll deductions subtracted from the Board’s normal cost calculations). When the trustee’s attorney, who is a partner at one of the largest municipal pension law firms in the city of Detroit and is the law firm involved with Michigan’s largest public employee pension associations, MAPERS, was asked to weigh in on the retroactive reduction, he indicated COLA is an accrued financial pension benefit, as defined by Michigan law. However, provided the Plan Sponsor had adopted Plan language (outside of collective bargaining) that indicated the Participant’s did not vest in the COLA benefit, such reductions were permissible. Later, the same attorney admitted a partner in his law firm had inserted the vesting prohibition in the Plan Document while restating the document for the Plan Sponsor. I might add, the Board was never provided notice of the law firms prior service to the Plan Sponsor. You might ask yourself, why is the Board not doing more? The answer to that question is simple, when the Plan Sponsor created the Plan Document by legislative resolution, they put themselves as a majority on the Board of Trustees. If you had even a modicum of financial acumen, you would know haw completely absurd that statement is. How can that POSSIBLE be a reasonable statement when it is clear (DO THE MATH !) that the annual 5-6% employee contributions (INCLUDING all investment earnings thereon) RARELY accumulates to an sum at retirement sufficient to buy more than 10-20% of this employee’s TOTAL pension, including the added value of the COLA component ? Cutting COLAs should rightfully ONLY be step #1 in reforming (i.e., MATERIALLY reducing) Public Sector pensions. By any reasonable metric, Public Sector pensions are grossly excessive when compared to the Pensions typically granted Private Sector workers earning the SAME pay, having the SAME years of service, and retiring at the SAME age. With few Public Sector workers earning lees in “cash pay” than their Private Sector counterparts (and EQUAL Public/Private Sector “Total Compensation” in comparable jobs being the appropriate goal), there is simply ZERO justification for the Taxpayers to fund pensions (or benefits) ANY greater than what THEY typically get from their employers, let alone those promised in the current structure where the value of Public Sector pensions is always AT LEAST 2x greater, MOST OFTEN 3x-4x greater, and for safety workers USUALLY 4x-6x greater in value upon retirement. Taxpayers are fed-up with the decades-long financial “mugging” that has been perpetrated upon them by the insatiably greedy Public Sector Unions/workers and our enabling elected officials bought-off with Public Sector Union campaign contributions and election support. It’s WAY past time for a change. Taxpayers …. DEMAND IT ! maynardGkeynes says, YOUR \part of the bargain\ was NEVER reasonable, as RARELY do Public Sector employee contributions (INCLUDING the investment earnings thereon) accumulate to a sum at retirement sufficient to buy more than 10-20% of the total cost of your extremely generous pension promises. The 80-90% balance is foisted upon Taxpayers whose pensions (in comparable employment) are typically 1/4-1/3 of the grossly excessive level promised to you. YOUR pensions are far more \over-stuffed\ than Gov. Christie’s waistline. In N.J. Police & Firefighters are not in Social Security. Police & Firefighters BENEFIT from NOT being in SS as those earning near the maximum wage base (as are most police in NJ) receive a VERY poor return on their investment. Only LOWER-wage earners and those with non-working spouses get a favorable return on their contributions. And for anyone believes that had Police & Firefighters been IN SS that their current total compensation would be 6.2% higher (reflecting the employer’s contribution to SS on the worker’s behalf), I say baloney …. their total compensation would be the SAME via 6.2% less in cash pay. And if Police & Firefighters have not privately saved and invested the other 6.2% of pay that would have come out of their OWN net earnings (as THEIR contribution to SS), well, that was just stupidity on their part, and not the Taxpayers’ problem. Readers should know that this article is in effect propaganda designed to support the breach of public pension contracts. To be honest, this article should separate out legislative reductions of “automatic” COLAs by “new worker,” “current employee,” and fully-vested retiree. The provision of this detail would detract from the article’s purpose as propaganda. To be honest, this article should identify COLA reductions for COLAs that are “ad hoc” COLAs (which may legally be reduced) or “automatic” public pension COLAs which are part of the accrued benefits of the public pension plan. 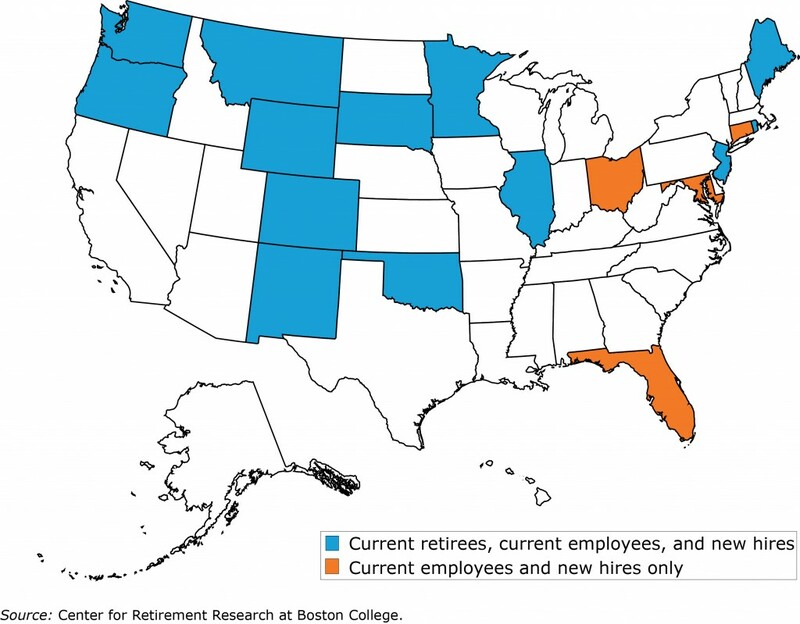 “Automatic” public pension COLAs are reported to the federal public pension regulatory agency GASB, and are included in actuarial assumptions for the plan. Automatic COLAs are as much a contractual obligation of plan sponsors as are plan “base benefits.” Visit saveperacola.com. Well Al, most Courts disagree with you, and that’s what counts.